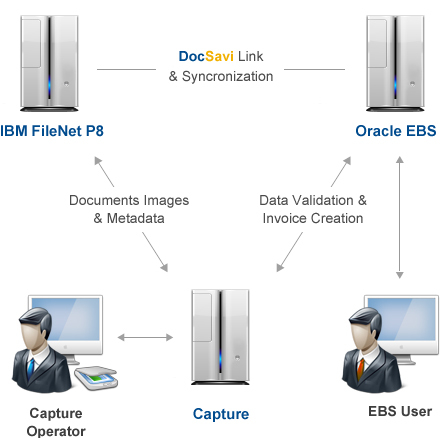 DocSavi is frequently used to automate Accounts Payable processes, by using capture software such as IBM Datacap or Kofax Transformation Module to automatically create invoices and import them into Oracle EBS. DocSavi reduces the cost of processing AP invoices by up to 80% by automating the process within a single step. HR documents can be captured and stored within IBM FileNet Content Manager or CMIS-compliant repositories where they are kept secure and easily available for viewing within and outside of Oracle EBS as needed and authorized. GL journal entry supporting documentation can be kept to ease the time spent for audits by making the supporting documentation available at your figure tips. Engineering drawings can be linked to Oracle inventory items. Oracle Purchasing Vendor contracts, W-9s, correspondence. Oracle AR Customer contracts, correspondence, etc. Oracle Project Costing plans, status reports, task lists, etc. ANY Oracle EBS module containing an entity or transaction. With DocSavi, your end-users access and utilize content within Oracle EBS without needing to leave the Oracle screens or learn new software.